Chinese Medicine is all about balance. Balance in all aspects of life is what keeps us healthy and keeps disease away. In a time long ago, this balance was the normal way of life for most people, and they understood the importance of doing things in moderation – like eating, physical activity, expressing of emotions and all aspects of life. Chinese Medicine has always taught that this moderation in all things is the way to achieve balance and is ultimately the path to health. When something in life becomes unbalanced, illness can result. When this happens there are wonderful tools to help put the body, mind, and spirit back into a harmonious state – like acupuncture, Chinese herbs, moxibustion, gua sha and tui na. These are just some of the tools that Chinese Medicine has in its formidable toolbox. But ultimately, the goal is to live a balanced life so that illness never has a chance to develop, Chinese medicine is a medicine of prevention. Now, many of us are living unbalanced lives in an increasingly unbalanced world. Finding the equilibrium that our ancestors enjoyed becomes more difficult as we live in a world that is more complex, and needs us to work more in a time where most of us are able to have less. There is a growing disparity between people who have and those who have not. Cities are growing as nature dwindles. People are being pushed, working more, sleeping less and getting sick because that balance has been lost. So what can we do? It is not realistic to quit the jobs we need to survive, and many of us live lives that we must and not the lives we would like to. One of the ways that we can get back to that balance, that equilibrium that keeps us aligned and happy is to slow down, sit and listen. There are many ways to meditate, and everyone needs to find the one or the ones that are right for them. For some, walking is a wonderful healing type of meditation. For others, painting, cooking or writing poetry is their meditation of choice. I like to define a meditation as being in a state of complete harmony and flow. Like you are completely connected to the universe and in a state of bliss where time completely disappears. This is only my definition, but a similar sensation has been described by others in a state of deep meditation. It is like being in a complete and all-encompassing state of mindfulness. The list of meditations benefits is really enormous and there isn’t enough room here to list them all. But for practical reasons, I can share an example of a meditation practice that can help to rebalance mind, body and spirit as well as all the benefits listed above. One of the first things you can do, is to create a beautiful, calming, peaceful space where you will do your meditation. If you can, remove all electronic devices so that the space is quiet and you will not be disturbed. Keep the space clean and clutter free as this will help eliminate distractions while you are meditating. 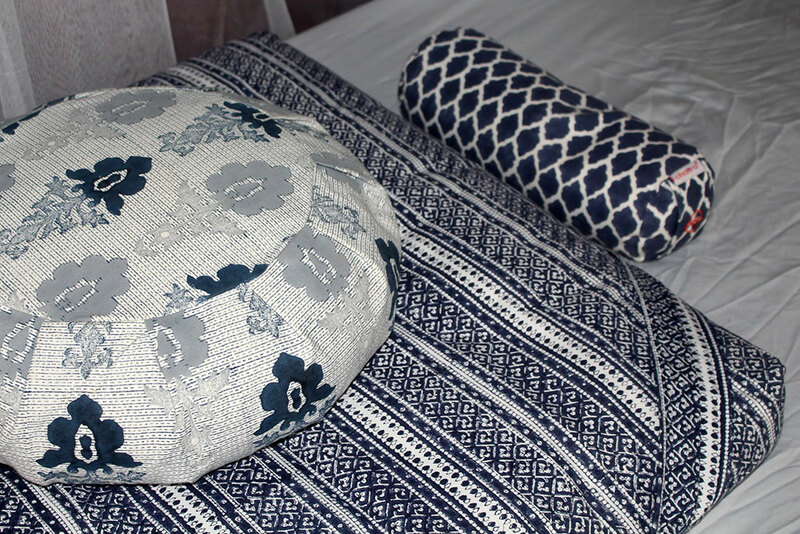 If you have a meditation cushion, you can arrange it so that it is appealing to the eye and when you look at the space in its entirety, it gives you a feeling of calm and joy. I am lucky to have a beautiful meditation cushion (which is from the lovely people at Chattra) – whenever I look at it, it makes my heart so happy and I thoroughly enjoy sitting on it. 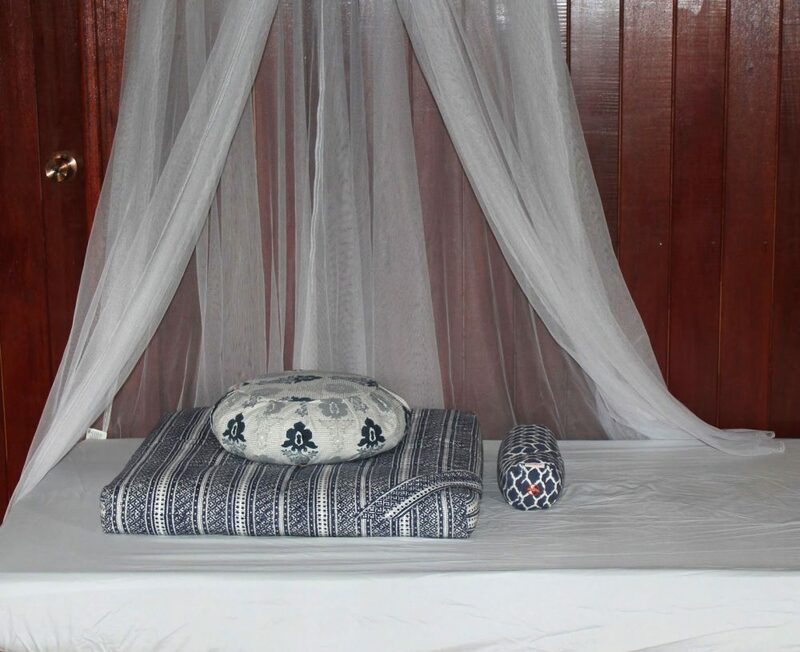 I don’t have a lot of space, so I create a tiny space for myself with my cushion and a mosquito net which is lovely and really gives it an enchanted feel. Create your space however you desire, using objects (or the lack of objects) that make you happy and help to create a feeling of calm and serenity. you can see all their beautiful designs here in their shop and enjoy 10% off (see coupon below). You can choose however long you like in terms of your meditation practice, but I suggest that if it is new to you, to start slowly. You can start with just five or ten minutes a day and work up from there. I find that a good number is twenty minutes a day, or if you are ambitious, twenty minutes twice a day, morning and evening. Twice a day is ideal as it acts as a primer for the day and a bit of a cleansing of the days energies before bed to ensure a good, restful, rejuvenating sleep. If you can set aside twenty minutes when you wake up before you start your morning routine, you will find that you will set your intention for the day and be better able to focus as well as being better able to handle difficult situations. The more you meditate, the more you will find this equanimity in your life and in all things. In the evening, do everything you need to do and do your meditation right before sleep. You will find that the quality of your sleep will improve and you will wake up feeling more rested and ready to start your day with positivity and awareness. As mentioned above, there are many different types of meditation, and I always recommend to patients that they find the one that feels right for them. A good way to start if you are looking for ideas is to sit comfortably in your meditation space and begin to focus on your breathing. Focus on your breath moving in and out of your body. I sometimes suggest trying to focus on breathing light into the top of your head, gathering the breath and all dark energy, emotions or experiences we are finished with, illness, pain or trauma and breathe it out with every breath. Sometimes, when you begin, it is good to have something to focus on and this one has worked for me, and for my patients. Keep breathing deeply in and out focussing solely on the breath. Your mind will inevitably wander, but when you notice you are somewhere else in your mind, gently bring yourself back to the breath. 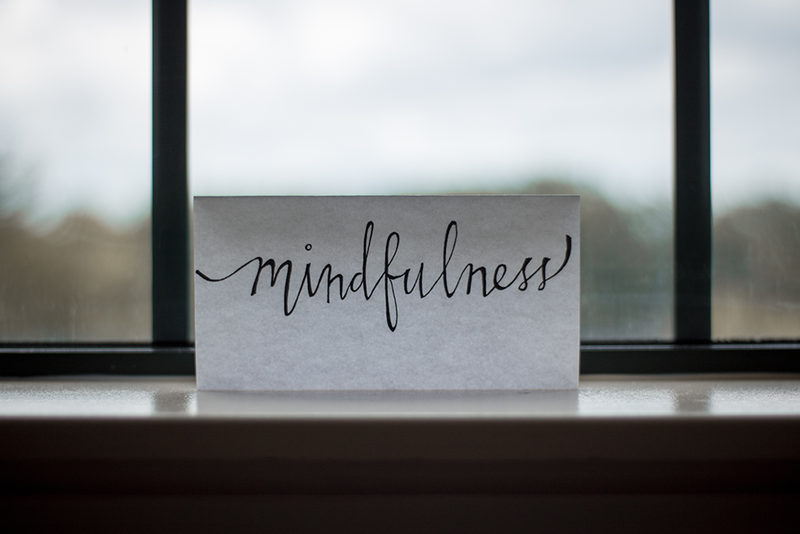 At first, your mind will be all over the place – this is called monkey mind by the Buddhists (and here is a great definition) – but just keep bringing yourself back to the breath. This will get easier and easier the more you meditate. And try not to be hard on yourself. There are days when you will do nothing but bring your mind back to the breath, over and over again. But over time, you will find that you will have to do this less and less and that your mind will settle into a peaceful quiet which will allow you to connect to yourself in a way you may not have done before, and that is a wonderful thing indeed. Chinese Medicine Living readers can enjoy this 10% off coupon in the Chattra shop. Visit www.chattra.com or click on the coupon below.